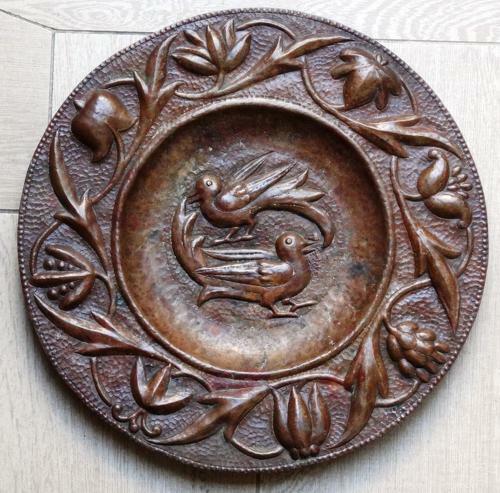 An Arts & Crafts very well patinated repousse copper charger/welled dish by John Pearson, one of the best Arts & Crafts metalworkers of his time, who worked with Ashbee at the Guild of Handicraft, then at Newlyn where he also taught, and then for himself, supplying Liberty and Morris & Co. Fully signed and dated to back, JP1901 and also numbered. Typical repousse stylised birds to the centre, with floral/leaf design to the outer rim.